It has generally been assumed that after the signing of the Anglo-Irish treaty in 1921 and barring the issue of partition the land question in Ireland had, in effect, been settled. However, when W. T. Cosgrave’s Cumann na nGaedheal party formed their government in 1923 it became apparent to the government that the challenge remained unresolved. 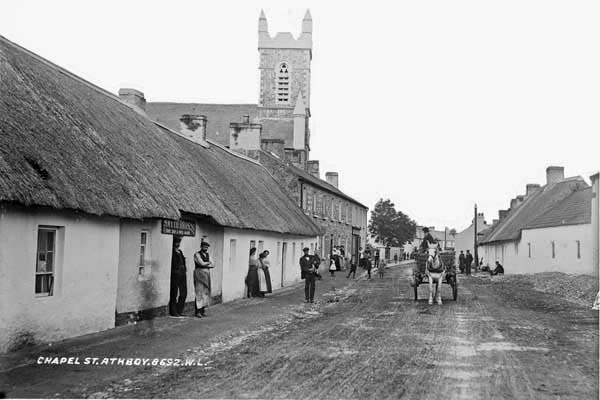 Land reform had been on the Irish agenda since the latter part of the nineteenth century. Bodies such as the Ecclesiastical Commissioners, who conducted the disposal of Church lands after disestablishment under the 1869 Church Act, and the Congested Districts Board which had been instituted, under the 1891 Land Act, were established to address the problem. 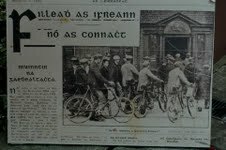 The Irish Press reported in November 1933 that a group named ‘Gaedheal’ had formed with over ‘one thousand eager Gaels’ dedicated to the hastening of ‘Ireland, Free and Gaelic’ among their ranks, their mission was the same, the regeneration of the Gaeltacht and the preservation of the language. However, it is argued that it was the radical left wing group Muintir na Gaeltachta, led by Máirtin O Cadhain, which made the most impact. Before the successful migrants, all from Connemara, were due to take ownership of their new land, representatives of Muintir na Gaeltachta arrived to inspect the new sites. During this visit they were welcomed by a deputation from the Old IRA. One of the migrant’s leaders assured them that only Gaeltacht migrants ‘with sound Republican views and outlook’ be accommodated. While this meeting was an extremely cordial meeting not everyone was enamoured with the project. Vocal opposition to the colony project from some politicians was reflected on the ground by a small but noticeable section of the local Meath community, which on several occasions resulted in acts of intimidation towards the migrant community. Soon after the initial influx of migrants had arrived some of the houses which were due shortly to be occupied were attacked. Shots were fired into several houses while one was broken into and items stolen. Among the items stolen were paint and brushes which were used to paint inscriptions on the doors of the houses. The inscriptions read: “No more migrants wanted here”, and “This land is not for Connemara people – it is for Meath men”. A number of men were arrested over the incident but were released without charge. Another incident saw an attempt to burn down a house built for migrants in the Gibbstown colony. A more sinister incident was reported by The Meath Chronicle on April 27, 1935 when a local Meath resident was arrested for threatening the life of Land Commission employee Mr. Michael Lynam after he was overlooked for a plot of land by the Commission in favour of a migrant. There were also allegations of migrant women being hassled by ‘gangs’ and being told ‘to quit talking that gibberish here’ when speaking Irish. ‘Through the medium of that which both loved, the Irish language, the migrant found that the Meath man was not out for his blood and the native discovered that the colonist was a human being like himself, not a humourless, suspicious individual, but a cheerful, friendly fellow anxious to live amicably with his neighbours’. Friction with locals was not the only negative experience migrant families were faced with in these early years. Some felt that despite their resettlement to better land they had in some ways been let down by the Land Commission. Part of their resettlement package entitled them to the communal use of equipment and livestock, however, there were complaints that the equipment needed to work the land arrived too late. Some complained that a horse and plough had only arrived six months after them, leaving it too late to successfully farm the land that season. This phase of colony migration only lasted for a short period with the government calling for a rethink in strategy in 1939, citing the problem of spiralling costs. Under Fianna Fáil from 1935 to 1939 it was estimated that 660 people had been resettled to the Ráthcairn and Gibbstown areas from western Gaeltacht regions. The Land Commission report for the period April 1, 1938 to March 31, 1939 stated that this covered 99 holdings and cost £38,288 with additional costs for infrastructure bringing the total to £54,616. It was stated ‘we are satisfied that the experiment, though somewhat costly, has been justified by the results obtained. The migrants generally have now definitely made good in their new holdings and are able to maintain themselves and their families at a higher standard of living than heretofore’. The Commission also suggested that one to four uneconomic holdings in the west were improved for every family that moved east under the scheme. Therefore it may be argued from the point of view of regeneration within western Gaeltacht areas that the ‘experiment’ was a success. Moreover, the fact that there is still a Gaeltacht region in the Meath area with an estimated population of 1,591 over seventy years after the first Fianna Fáil sponsored migrations may also be seen as vindication for the Land Commission’s statement. It is clear that there were problems with the colony project, not least of which was the effect on relations between the local population and the migrant community. 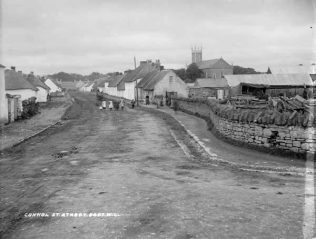 Speaking in 2010, on the 75th anniversary of the first migrant arrivals, one member of the Ráthcairn Gaeltacht said that tensions between the communities were noticeable up until the 1970s. The migrant community had been accused of being a disruptive influence upon a local way of life by bringing in what almost amounted to alien cultural practices to the area. They were accused of being merely pawns or willing co-conspirators in Fianna Fáil’s quest for a larger share of the vote in the area. Claims of Fianna Fáil voters being given preferential treatment in the allocation of land through the scheme were rife. While it is unclear if it was a widespread practice, the president of the Fianna Fáil cumann in Dunboyne Co. Meath admitted in 1937 that some Fianna Fáil members may have gotten preferential treatment ‘because the local Cumann looked after the interests of its members’. He also stressed that all allocations were submitted to the Land Commission in the proper manner. What does seem clear is that Irish speaking migrant applicants were given preferential treatment over local applicants with a lesser knowledge of the language. This did little to endear migrants to the local population. It would also suggest that in de Valera’s vision of ‘Irish Ireland’ there was a hierarchy of Irishman, and the Irish speaking migrants who populated Meath in the 1930s filled this criteria. My only knowledge of Rathcairn was in 1990,s and it did not endear me to that community in any way.